As the drinks were poured, Lidia entertained us by talking about how they are made. Generally, amari are built on a base of strong alcohol that has been infused with herbs, roots, and sometimes fruits. They occupy a strange space because of their dual role as both pleasurable and medicinal drinks. Italians are big on this. Pick up any bottle of mineral water in Italy, and somewhere on the label will be a little testimonial by a chemist from the University of Bologna (or wherever) stating that drinking L’Acqua di Cavilfiore is good for the digestion and urinary health. Because you need a chemist to tell you that drinking water will help you empty your bladder. But make no mistake. They are drunk for pleasure as well. 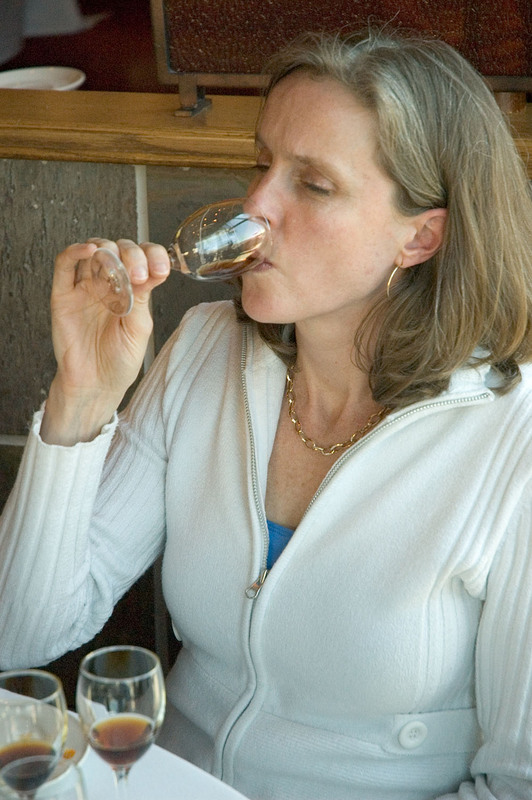 Bitter tastes are valued because they have a tonic effect, cleansing the palate between meals. As we were about to discover. We decided to follow Lidia’s advice and taste the liqueurs in order of bitterness, from mildest to strongest. 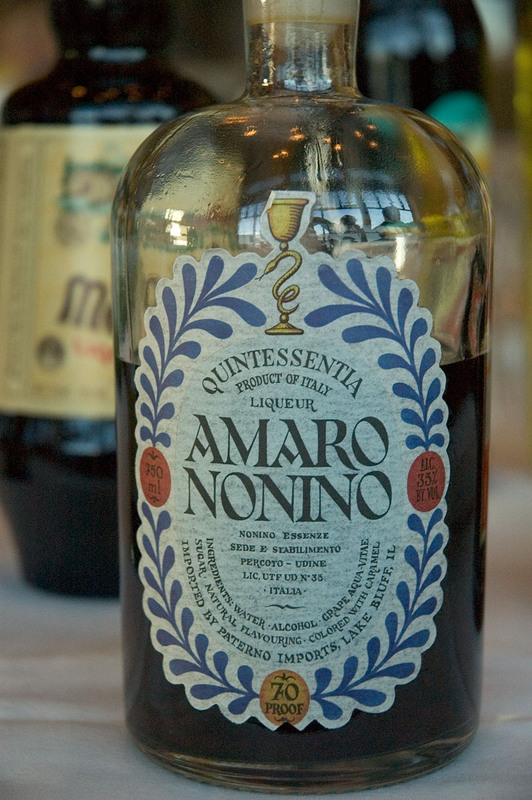 First up was Amaro Nonino. This is Dave Wagner’s favorite, but since he’s a regular visitor to their distillery, he admits he might be biased. _Laura: _I like it a lot. It’s sort of orangey-liquoricey. It’s not particularly bitter. It reminds me of some Mexican coffee I had recently that you make with sugar, orange rind, and coarsely ground coffee – it’s actually similar in flavor to it. Steve: Sort of a hint of white pepper, maybe? You have the orange that’s sort of burnt, and there are warm spices as well. John: It has very much a pine overtaste to it. The pine flavor is slightly similar to rosemary. It’s subtle, not at all as bitter as I expected. Ann: I, unfortunately don’t have much new – it’s sweet and its orangey and it isn’t very bitter and there is a spiciness to it, with pepper. Kilolo: There’s almost a hint of cinnamon to it. Peter: I really like the texture. One thing I don’t like about some amari is there’s a syrupyness to them. With this one there’s almost an effervescence to it, it almost evaporates off the tongue. The taste – I agree with John it’s not whacking you in the face with its bitterness. Lidia: At the end, after the alcohol and the pepper – the taste travels in your mouth. I would say in here there are perhaps 30 different elements. Cardamom, yes? Anise, which all of these will have in some amount. And many others. Trying to distinguish all these tastes is part of the pleasure. David: I was visiting the Nonino distillery once and when I was alone with one of the distillers tried to get him to at least give me a hint as to what was in it. “Come on,” I said, “you can tell me.” And he just smiled and said “Of course! Just as soon as you tell me the formula to Coca-Cola.” The distillers really do view their recipes as secretively as Coke views its formula. So while we can guess what’s in these, we’ll never know for sure. Ann: I have to say, I’m really enjoying just smelling these and comparing them. One smells strongly of butterscotch, one smells like mint, others smell strongly of oranges. I didn’t expect this variety of scents. 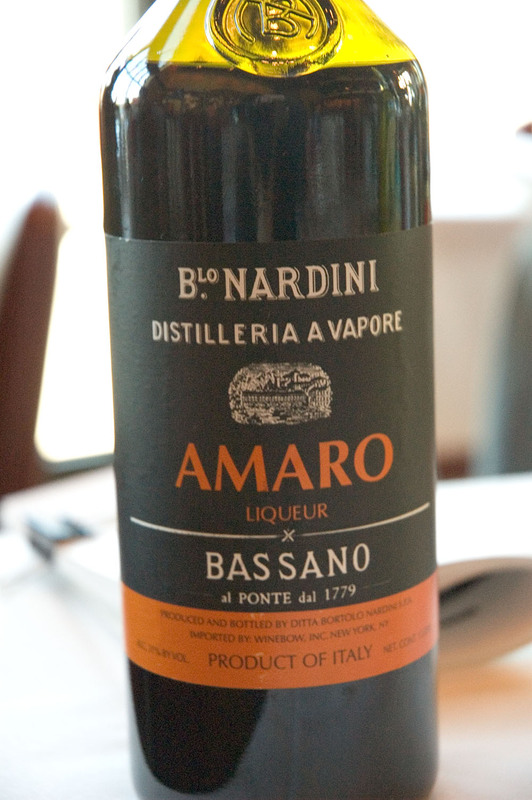 The second drink we tried was the Amaro Nardini, which has the distinction of being based on grappa, rather than a more traditional alcohol. Laura immediately took to it. Laura: Wow. Just…wow. It flows right past the center of my tongue. It’s an odd flavor, and odd location. It’s like a stripe right across the center of my tongue. Kilolo: This reminds me of being home in bed, and stuffed up. Ann: I don’t know if I would necessarily choose this because it is too medicinal for me. Lidia: This is from the region closer to venice, where the tradition is for a more assertive amaro. Peter: The aroma would probably push me away from choosing to drink this, but I want to say something positive about it, which is that it is much less sweet. Much less cloying. The Nonino left an aftertaste in my mouth taste like caramel, and this left it a bit more refreshed. John: It has a more pronounced lingering bitterness too. More like what you’d find in a Campari. Laura: I actually like this. One of the reasons I seek out things like this is because they’re giving me something new. This is giving me a completely fascinating sensation. Lidia: What you’re talking about is really the pleasure and the enjoyment of why we eat. It’s not just to nourish us, although it is nourishing, but there is also something spiritual. To be in tune, to have different sensations awaken. Peter: And this is built on a grappa base? John: That’s surprising to me. I don’t like grappa, but I do like this. 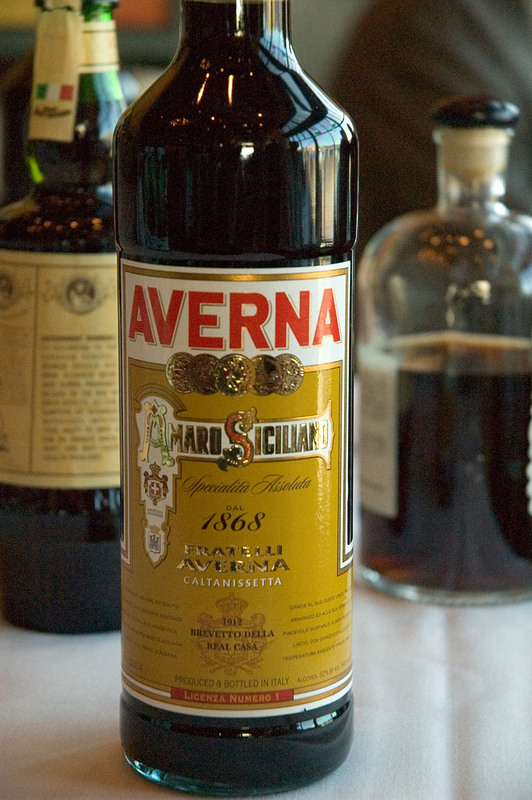 Next up was one of the classics, the Sicilian bitter Averna. Peter: I find this almost indescribable, but somehow this just shouts “chocolate” to me. I mean, it doesn’t taste anything like chocolate, but at the same time it tastes exactly like chocolate. OK, that makes no sense, but it’s true. Laura: (laughing) It makes me sneeze! But I agree with Peter, it’s very chocolate-feeling, somehow. It’s almost tastes like a candy bar I get from a store in the strip which has candied orange peel in it. Peter: It’s sweet, but not really fruity. John: It’s almost more difficult to distinguish than the last one. It tastes like bitter butterscotch to me. Ann: Yes, very butterscotchy. It’s very full-bodied. I can feel it leave a tail down my throat. Lidia: Averna is from Sicily, which I think is one reason that it has so much more fruit than the others. The chinotto, the bitter orange, is very evident here. At this point, halfway through the candidates, I noticed that everyone seemed more relaxed, more animated. As the bottles were passed around, the glasses were being refilled more generously. A few cheeks were flushed as we moved on to Amaro Montenegro. The Montenegro was a glowing, crystal-clear amber, as compared to the other drinks which were mostly dark brown, drab, and opaque. Peter: This one intrigues me because its color is so different from the others. So visually it’s the standout. Kilolo: It looks like a jewel. David: In terms of our setup here, going from least assertive to most, this is what I really perceive as the turning point to the truly bitter ones. _Lidia: _ It’s very elegant. It doesn’t depend so much on the sugar, or the caramel. It’s a nice extraction. It has a nice homogenized flavor. Peter: This literally tastes like – you can just see some guy in your mind’s eye with a bunch of alcohol and bunch of roots and sticks, mashing them up. Laura: Yeah, the bitterness, the bitter herbal flavor here is quite in your face. Ann: This is almost floral. Laura: But it is a very bitter orange scent. Lidia: Montenegro is made in Bologna. It is more of an herbal base. In Sicily, there are more oranges, fruits, and you can taste that in the amari. There is a scent of orange here, but not as strong as in the Averna. Steve: It’s almost an orange blossom aroma, rather than orange. I used to live in Florida, and the aroma of oranges was one of the best things about living there. You get that sort of lingering, heavy aroma that’s really nice. David: It reminds me of an Italian sunset, because that’s when I first tasted Montenegro. I was in Montalcino, with a glass of Montenegro, looking out on a sunset over the hills. Peter: There’s almost an overtone to it that reminds me a little bit, although it is much more elegant, of Retsina. Ann: Retsina is oily, though. This isn’t. Kilolo: To me it tastes like lemongrass. Laura: If you wait long enough, it tastes almost smoky, in the very back. You have to wait for it to develop though. Peter: The depressing thing to me is that I look at this array, and I know there are people that wouldn’t even try these. If they tried them, they wouldn’t like them, but that’s a different sort of depressing. What really frustrates me is that they wouldn’t even make it into the glass. David: So you have to make it your mission to get people to try these. Ann: I was saying to Peter earlier, before we began the tasting, that there is romance to all this stuff, with the image of it. Peter and I are both big romantics, and I have a feeling that that’s why we both like this sort of thing. And I think that’s kind of how you have to sell it – as this romantic thing, conjuring up an image of a lifestyle. Lidia: I think what Steve says is true. One of the things these really have going for them is they really are all natural. Most liqueures are made with chemical flavorings. Here, they really are steeping bark, herbs, fruits, and so on. Steve: Today, people are eating things that are terrible that they perceive as medicinal. I’d think that this would be an easy sell. Peter: And mentioning marketing brings us to Cynar. And I’m sorry. We need to contact Cynar’s distributor. We need to invite their representative here. And then we need to walk them around the restaurant with the bottle to watch people recoil in horror at the artichoke on the label. It is the worst label I’ve ever seen. Kilolo: Where did it come from, though? Ann: Wasn’t the artichoke symbolic of something to the Romans? Lidia It’s supposed to be good for the digestion. Like artichokes, it actually contains a little cynarin, which stimulates bile production. Peter: The other problem for me is that I like artichokes, and so I’m always angry at Cynar, because it doesn’t actually taste like artichokes. But enough from me on this. Laura: The interesting thing about this is that I’m completely unable to identify the smell. It just doesn’t register – it smells like Cynar. It doesn’t smell like anything else. Lidia: It smells like Chinotto. Laura: You fed me that soda once! I should have never let you talk me into tasting it. Peter: I was trying to get rid of it. I was desperate. Ann: This makes a really fast transition from sweet to bitter. Steve: And there’s a real smokiness to it. David: It’s interesting, it’s like what is appealing in America or is not. 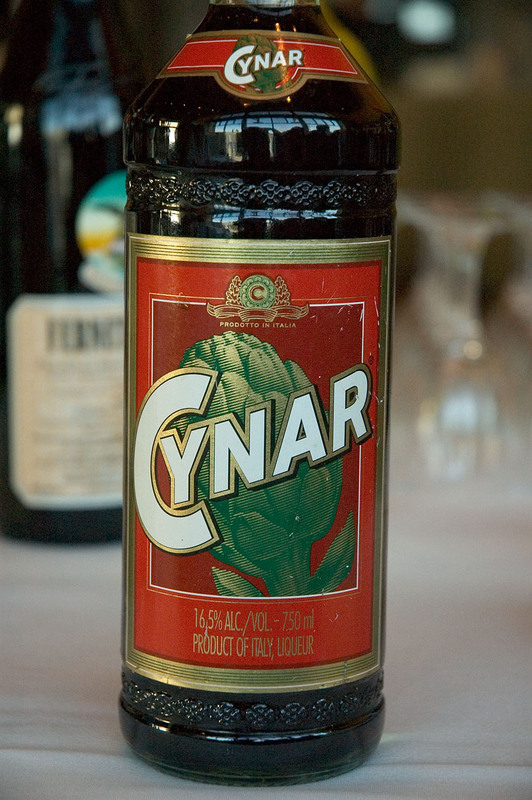 The Cynar name, the label and the artichoke are all of great value in Europe. Why compromise them for Americans? It’s a big subject in the rest of the world where they are adapting to the American palate because it’s the biggest market. Look at the Mondavi effect, where the artesianal winemakers are losing out to the big, Wal-mart-ized wine makers in each country. It’s a real shame. 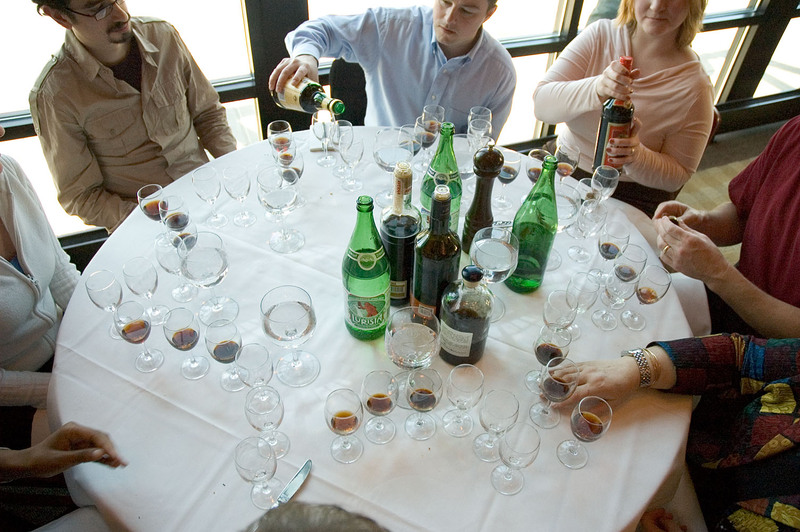 We were down to our last glass: the archetypal amaro: Fernet Branca. Peter: In Europe, this is famous, and I’ve never had it because the State Liquor stores here are terrible. Laura: It tastes like Pine-Sol. It’s itchy and piney. Not in a bad way, but it…hmmmm. Peter: I always thought that Branca Menta, where you mix this with creme de menthe, was about trying to make it mintier, but now I realize the creme the menthe is to cut it or make it smoother. Or make it not hurt quite so much. Ann: It has almost a powdery or a talcum-like aroma. David: I think that tasting them as we are is appropriate, but if you were having this as a digestivo, it would be on the rocks. Peter: I like it, but not without reservations. Some of these others, like the Montenegro, I would force a guest to try and then if they didn’t like it I would yell at them and try to figure out what was wrong with them. But this is so over the top and intense that I would not insist that a guest enjoy it as much as me. Of course, this is my sixth drink, so maybe that’s why I like it. David: I think that for me the Nonino is the one that I consider the best introduction. Lidia: Also, you can put this in coffee, in espresso. Ann: For me the most notable aspect is the chalky aftertaste. Laura: This just feels like it should go in cream to me somehow. John: This is not light. It’s less mellow than all of the others combined. I’d like to give this to my dad and see the look on his face. Having tasted all the drinks, we sat back and reviewed what we had experienced. The clear favorites were the Nonino (as a gentle introduction) and the Montenegro (as a somewhat more assertive and interesting choice). The Fernet was mostly eyed with fear and awe, even by those of us who liked it. Laura felt the Nardini was unique and loved it because of how it felt in her mouth, but the rest of us viewed it as tasting and smelling too medicinal too be enjoyable. The Averna, we agreeed, was balanced but perhaps a little too sweet, and fared worse from being immediately compared to the Montenegro. No one except Lidia was really willing to stand up for Cynar. Hopefully, the designated drivers (and you, dear reader) will get a chance to try some of these soon. They are interesting, unique, and can be found or special ordered at most liquor stores. If you enjoyed this piece and would like to read more about amari, Laura Valentine has written about her experiences at the tasting with great eloquence . Tea Leaves would like to thank everyone who made this possible: Lidia’s owners Lidia Bastianich and Dave Wagner, and Lidia’s of Pittsburgh manager Michael Fitzurka, as well as our panelists (John Barbera, Anne Funge, Kilolo Luckett, Steve Posti, Laura Valentine) and their designated drivers, who had to watch us drink delicious liqueurs and then listen to us talk about them incessantly for the rest of the day. Thanks also to psu, who took the photos, and Chetan Ahuja for videotaping the event, making this transcript possible.